A strike team of brush engines and fire fighters from around San Diego County departed Tuesday to help fight a wildfire in Riverside County. The strike team is made up of three brush engines and a battalion chief from the San Diego Fire-Rescue Department, a Chula Vista Fire Department brush engine and other resources from the Poway Fire Department, according to SDFRD spokeswoman Monica Munoz and Chula Vista Deputy Fire Chief Harry Muns. The San Diego-area crews were dispatched about 4:15 a.m. to help battle the so-called “Mias Fire” as part of California’s mutual aid system, which coordinates fire crews from around the state to ensure enough firefighters are dispatched to battle a blaze. Earlier this year, SDFRD Chief Brian Fennessy said the statewide mutual aid system is “the most robust and functional” in the world. The “Mias Fire” ignited shortly before 4 p.m. Monday east of Riverside near Banning and had blackened roughly 540 acres as of Tuesday morning, but was not immediately threatening homes or other structures, according to the Riverside County Fire Department. The non-injury blaze, which was 5 percent containe as of 7:30 a.m., was caused by a tree branch that fell into power lines after the branch was weakened by an active beehive inside of the tree, authorities said. 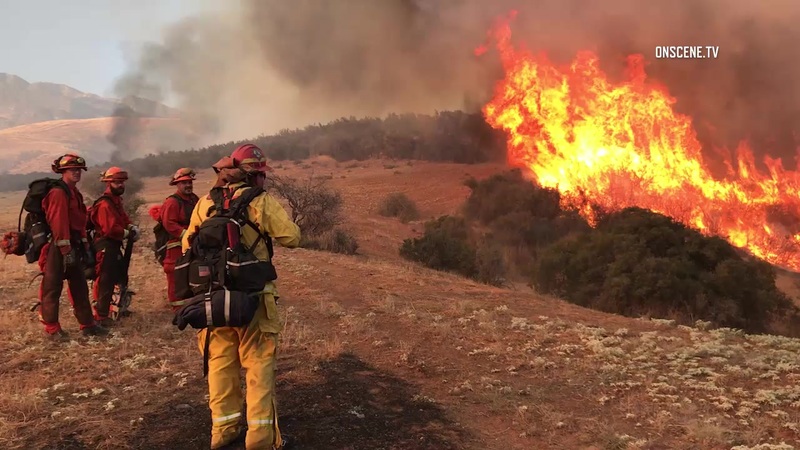 Riverside County is the main agency battling the flames with the help of the Morongo Fire Department, U.S. Forest Service crews and now the San Diego County firefighters.